Vitamin E, no other vitamin appears to cause as much controversy. I am digesting an article titled "Regulation of cell signaling by Vitamin E". It is a very meaty article and I feel a wee bit over my head. As I digest and understand it will be posted. For a long time Vitamin E was seen only as an antioxidant. This we all should know! However it was not until 1991 that the level of vitamin E had a direct effect on a protein that caused smooth muscle proliferation. In simple terms smooth muscle is the muscle that makes up the middle layer of your veins and arteries. This is shown in the figure to the left, called the Middle Coat. 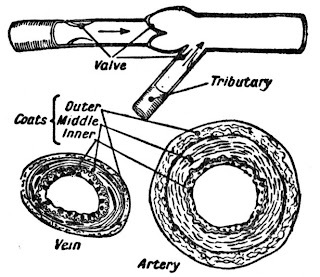 The figure down and to the left is a diagram of small artery and vein of a child. 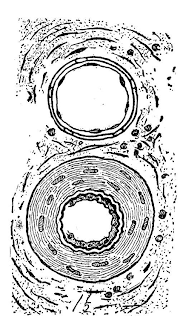 The top diagram is a small artery and shows only a very small middle layer. Where as the veins middle layer is much thicker. So as you can imagine when this layer grows (proliferate) the blood vessel becomes smaller. And this is related to heart disease and other issues. Any way back on topic. The vitamin E directly reduced the level of Protein Kinase C. Therefore the smooth muscle lining of the blood system was not being told to grow and proliferate. So this was a very important find. So since 1991 there has been much research in this area, and this review article is published in 2002, so further work will have been done. However due to the complexities of the article I will just unpack this article so we all have a good foundation for any future work.